The Flood Warning Continues For The Red River Near Burkburnett. * From This Morning To Friday Evening...or Until The Warning Is Cancelled. * At 4:30 Am Thursday The Stage Was 8.4 Feet. * Minor Flooding Is Forecast. ...Read More. ...the Flood Warning Continues For The Following Areas In Texas... Navasota River Above Groesbeck Affecting Limestone County The Flood Warning Continues For The Navasota River Above Groesbeck. * At 0115 Am Thursday The Stage Was 6.76 Feet. * Flood Stage Is 7 Feet. ...Read More. ...the National Weather Service In Houston/galveston Has Issued A Flood Warning For The Following Rivers... Navasota River Near Normangee Affecting The Following Counties In Texas... Brazos...burleson...grimes...lee...madison Middle Yegua Creek Near Dime Box Affecting The Following Counties In Texas... Brazos...burleson...grimes...lee...madison ...Read More. A River Flood Warning Remains In Effect For The Davidson Creek. The Flood Warning Continues For The Davidson Creek Near Lyons * From Thursday Afternoon To Friday Afternoon Or Until The Warning Is Canceled. * At 0800 Pm Wednesday The Stage Was 14.2 Feet. * Minor Flooding Is Forecast. ...Read More. A River Flood Warning Remains In Effect For The Trinity River. ...flood Warning Extended Until Further Notice... The Flood Warning Continues For The Trinity River At Riverside * Until Further Notice Or Until The Warning Is Canceled. * At 0830 Pm Wednesday The Stage Was 133.7 Feet. ...Read More. ...the Flood Warning Continues For The Following Rivers In Louisiana... Calcasieu River Near Glenmora Bayou Des Cannes Near Eunice Atchafalaya River At Morgan City Calcasieu River At Old Town Bay ...Read More. ...the Flood Warning Continues For The Following Areas In Texas... Cowleech Fork Sabine River At Greenville Affecting Hunt County South Fork Sabine River Near Quinlan Affecting Hunt And Rockwall Counties The Flood Warning Continues For South Fork Sabine River Near Quinlan. ...Read More. ...the Flood Warning Continues For The Following Areas In Texas... Cowleech Fork Sabine River At Greenville Affecting Hunt County South Fork Sabine River Near Quinlan Affecting Hunt And Rockwall Counties The Flood Warning Continues For Cowleech Fork Sabine River At Greenville. ...Read More. ...the National Weather Service In Corpus Christi Has Issued A Flood Warning For The Following Rivers In Texas... Guadalupe River At Victoria Affecting Victoria County Guadalupe River Near Bloomington Affecting Calhoun...refugio And Victoria Counties .recent Or Anticipated Heavy Rainfall Over The Aforementioned ...Read More. ...the National Weather Service In Fort Worth Has Issued A Flood Warning For The Following Areas In Texas... Little River Near Rockdale Affecting Milam County Navasota River Above Groesbeck Affecting Limestone County Navasota River Near Easterly Affecting Leon And Robertson Counties The National Weather Service In Fort Worth Has Issued A ...Read More. ...the Flood Warning Continues For The Following Areas In Texas... Elm Fork Trinity River Near Carrollton Affecting Dallas County East Fork Trinity River At Mckinney Affecting Collin County East Fork Trinity River Near Crandall Affecting Kaufman County Trinity River At Dallas Affecting Dallas County The Flood Warning Continues For ...Read More. ...the National Weather Service In Fort Worth Has Issued A Flood Warning For The Following Areas In Texas... Trinity River Near Long Lake (oakwood) Affecting Anderson... Freestone And Leon Counties The National Weather Service In Fort Worth Has Issued A * Flood Warning For ...Read More. ...the Flood Warning Continues For The Following Rivers In Texas... Colorado River Near Ballinger Affecting Runnels County The Flood Warning Continues For The Colorado River Near Ballinger. * From Thursday Morning To Thursday Night. * At 7:00 Pm Wednesday The Stage Was 7.5 Feet. * Flood Stage Is 18.0 Feet. ...Read More. ...forecast Flooding Changed From Minor To Moderate Severity For The Following Areas In Texas... Chambers Creek Near Rice Affecting Navarro County Trinity River Near Rosser Affecting Ellis And Kaufman Counties Trinity River At Trinidad Affecting Henderson And Navarro Counties ...forecast Flooding Increased From Minor To Moderate Severity... ...Read More. GRAPELAND – The Grapeland Sandies entered Friday night’s game against the Buffalo Bison looking to atone for last year’s 51-12 loss in Buffalo. And for the first half, the Sandies looked like they just might be able to do so. Unfortunately, the Bison’s massive offensive line – averaging just a shade under 260 pounds – and the slipperiness of Buffalo QB Colton Green wore down Grapeland in the second half of play as the Sandies fell by a score of 60-20. The game started out well for Grapeland as they came out and hit Buffalo right in the mouth on their opening possession. 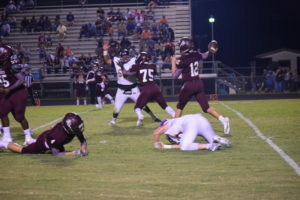 Faced with a third and 14 from their own 26 yard line, Grapeland QB Rick Frauenberger connected with freshman sensation BJ Howard for 37 yards to pick up a first down and move into Buffalo territory. Frauenberger picked up two on a designed run and then connected with Howard once again to bring the ball inside the Bison red zone. From there, Brayden Cheatham took a second down handoff, found the edge and scampered 13 yards into the end zone for the game’s first score. . The two point conversion attempt was no good, but the Sandies had staked themselves to a 6-0 lead with 9:41 remaining in the first quarter. On the ensuing kickoff, the Sandies attempted an onside kick but the ball was recovered by the Bison at their own 48. Green began Buffalo’s first drive of the game with a five yard pass to Dirk Kilgore but then a strange turn of events occurred. The Bison were flagged for illegal procedure on second down and when a Grapeland coach indicated the penalty was against the Bison, he was warned by the side judge for his action. While the coach was talking to other players and coaches on the sideline, he was flagged for unsportsmanlike conduct. The penalty gave Buffalo a first down at the 35 yard line of Grapeland. A 15 yard run by Green and a bruising 10 yard pickup from James Rodell moved the ball inside the Grapeland 20. The Sandies’ defense stiffened however and forced the Bison into a fourth and one situation at their own 12. Unfortunately for the home team, Green broke free on the fourth down play and scored a TD to even the score. Alvaro Sanchez banged the PAT through the uprights and with 6:26 remaining in the first quarter, the Bison took a 7-6 lead. The Sandies next possession ended with a three and out and the Bison took possession of the ball at their own 30. Green picked up six on first down, Rodell picked up 20 on second down and then Green connected with Kilgore for 23 yards. From there, it was the James Rodell show as he carried the ball three consecutive times and powered his way into the end zone from 10 yards out. Sanchez converted the PAT and the Bison had extended their lead to 14-6 with 3:06 still left to play in the first quarter. After the Grapeland offense sputtered on their next possession, the Sandies were forced to punt as Buffalo took over at their own 39 with the first quarter winding down. Once the second period of play began, the Bison began a methodical march towards the end zone, capped off by Green’s 14 yard scoring strike to Kilgore with just under 10 minutes left in the half. The extra point attempt was no good but the Bison had extended their lead to 20-6. The Sandies battled back, however. After getting sacked for the first time on the night, Frauenberger picked himself up off the turf and connected with Howard for 34 yards. On the next play from scrimmage, the junior QB found James Coleman on a slant across the middle and Coleman took the ball 27 yards to the house for a TD. Josh “Bear” Ackley knocked home the PAT and the Sandies had cut the lead to 20-13. 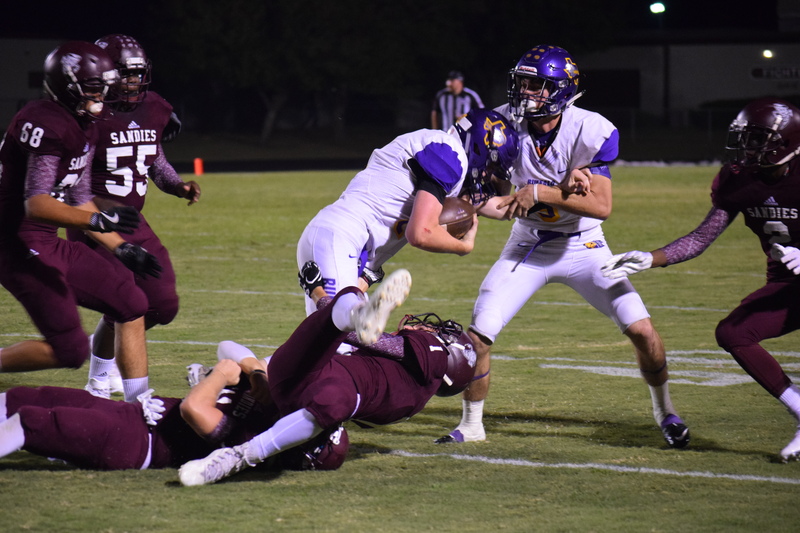 The next time Buffalo took possession, they started at the Grapeland 30, following a second unsportsmanlike conduct penalty against the Sandies. Green picked up 20 yards on first down and was followed by Rodell who picked up four more. The Bison’s QB picked up an additional two to move the ball to the four, but a h olding call pushed the ball back to the 14. On the next play from scrimmage, however, Green eluded several Sandie defenders and slithered into the end zone from form 14 yards out. Francisco Saldano converted the extra point attempt to make the score 27-13 and end the first half point production. Buffalo started the second half with control of the ball and marched down the field to score on a 19 yard Green TD. Saldano made the extra point to push the lead out to 34-13 with 7:37 remaining in the third quarter. Grapeland kept fighting and on their next possession, Frauenberger connected with Tyrin Wiley on a four yard scoring strike to keep the Bison within reach. Ackley’s extra point attempt was good and with 5:14 left in the third, the Sandies had cut the lead to 34-20. That was when the wheels fell off for the Sandies. Green found Kilgore all alone in the back part of the end zone and Kilgore made a fantastic diving catch for a 31 yard score. The extra point was no good. On the Sandies next possession, Frauenberger was picked off and on the following play, Jamaul Randle scored from 26 yards out to make the score 46-20. The Bison tacked on two more touchdowns in the fourth quarter on a two yard TD run from Kilgore and an 82 yard run from Randle to bring the final score to Buffalo 60 and Grapeland 20. The Sandies travel to Athens next week for a game against the Frost Polar Bears. Kickoff is scheduled for 7:30 p.m. Previous articleFreedom of Religion or Freedom from Religion?